Booked: Halls, Gough, Dawson, James, Hannah, McCombe. Maidstone United: Worgan, Hare, Finney, Wynter, Lewis, Sam-Yorke, Wraight (Loza 74), Reason, Twumasi, Hines, Pigott (ter Horst 90). Subs not used: Prestedge, Muldoon, Anderson. Chester: Lynch, Halls, James, Astles, McCombe, Turnbull (Rowe-Turner 90), Dawson, Hall-Johnson, Gough, Hannah (White 84), Archer (Zanzala 90). Subs not used: Mitchell, Bell. 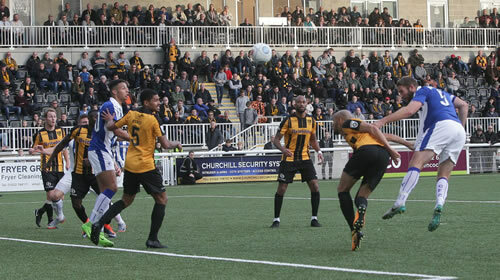 It was agony for Chester who were beaten by an injury time goal at Maidstone United to slip back into the bottom four. Manager Marcus Bignot was forced into a change to the side that recorded a win over Barrow in midweek with Andy Halls coming in for the injured Tom Shaw in midfield. Chester had the first chance of the game as early as the second minute as Ross hannah found Reece Hall-Johnson who surged into the box before pulling the ball back for Lucas Dawson who shot wide. Zavron Hines then went close twice for the home side seeing his shot parried by Alex Lynch before shooting the rebound over from 12 yards. The home side were getting on top and Delano Sam-Yorke headed just over when well placed. Both Hannah and Dawson saw long range efforts drift wide before Jordan Archer saw an effort from the edge of the box blocked by Alex Wynter. The last action of the half saw Stuart Lewis hit the post for the Stones with the ball bouncing back into the grateful arms of Lynch. Joe Pigott saw a free-kick curl just wide as Maidstone continued to press after the break. Sam-Yorke saw an effort blocked by Ryan Astles and Jamar Loza headed straight at Lynch to waste a great chance for the home side. There was seven minutes of added time and as the game entered the 95th minute a corner was only half cleared by the Chester rearguard and defender Alex Finney found space to shoot home through a crowd of players from 12 yards out to secure the three points for the home side. Chester: Lynch, Gough, Hall-Johnson, McCombe, Astles, James, Turnbull, Dawson, Shaw (Zanzala 63), Archer (Bell 86), Hannah (H White 70). Subs not used: Halls, Rowe-Turner. Barrow: Dixon, Barthram, Bauress, Hall, Bignot, Diagne, Hughes (Thompson 90), Gomis, Clements, Yussuf (Panayiotou 71), Harrison. Subs not used: Moore, J.White, Makoma. Marcus Bignot had recruited a couple of new signings since the weekend: both called Jordan. Jordan Archer from Stourbridge and under the nose of Tranmere Rovers who were reported to be interested in him – he went straight into the side as a striker. Jordan Gough, signed from Telford, replaced Lathaniel Rowe-Turner at left back. Visitors Barrow are also struggling this season and arrived just two places and one point above the Blues. Turnbull and Hannah returned to City’s starting line-up to face the club they were both playing for last season. Marcus Bignot’s brother Paul was named in the Barrow side. City began brightly and moved the ball with pace and purpose, soon forcing the Bluebirds on to the back foot. Dawson picked a delightful through ball for Archer and the new boy went through to stroke the ball past Dixon and open his account for Chester. The Blues revelled in their new found bravado and pressed for a second. Barrow were given little space on the ball as City closed them down as a team. James tenaciously took the ball off an opponent and fed a lively looking Hannah who cut inside and shot but straight at Dixon. Again James picked the ball up in midfield and threaded it forward for Archer – to whom the ball seemed to be sticking securely all night. He laid it back for Gough. His cross in to the box came out to Hall-Johnson who smashed it first time low into the back of the net. Another Chester account was opened and City were two goals to the good. The Blues maintained their dominance for the rest of the half and might, with a little more luck, have added to their advantage. Astles went closest when he saw his powerful header blocked on the line. Then as the referee’s board went up to indicate two minutes of added time, the Blues’ hard won advantage evaporated. First a deceptive ball over the top allowed Yussuf to steal half a yard on Hall-Johnson and the Barrow forward prodded it past the onrushing Lynch and in to the net. Almost as soonas the Bluebirds had got one goal back they were level. Another long punt forward skidded off the head of McCombe, Astles failed to connect and Byron Harrison was through to net a second. To lose one goal in first half stoppage time would be considered unfortunate - but TWO, to quote Lady Bracknell – was careless. And it reflected cruelly on City’s otherwise uplifting display. If anything, after the break Barrow emerged stronger – having cashed in their get out of jail free card. They enjoyed more possession than they had managed and City faded somewhat. Shaw, in his enthusiasm for tackling the opposition was treading on thin ice after his yellow card and was replaced by Zanzala. As the last quarter of an hour approached both sides refreshed their forward lines – White took Hannah’s place for the Blues and Barrow took off Yussuf for Panayiotou. The latter went mightily close to giving Barrow the lead as his looping header shaved the far post. But then Chester began to rally and find a second wind. They forced a succession of corners. From one James shot narrowly over the bar. From another Zanzala’s header was scrambled off the line. Then in the second minute of stoppage time a long ball forward from Astles was flicked on by Bell. Zanzala latched on to it, held off a defender, cut inside another but then saw his shot from six yards blocked by Joel Dixon. A fantastic save. Another corner resulted and this time Zanzala drifted to the far post only to see his header deflected off the upright and away to safety after another scramble. It looked as though the three points had eluded City until deep into stoppage time, Zanzala laid the ball back to Gough. His far post cross was hacked clear to the edge of the area and Dawson ran on to it to strike a skimming shot through a thicket of legs and into the back of the net. Chester fans, so used to being on the receiving end of a sucker punch themselves, went delirious in celebration of the winner. Ecstasy abounded. Manager Marcus Bignot too ran wildly down the touchline – albeit in the wrong direction. There was just time for him to receive a ticking off from referee Joe Johnson and for Barrow to kick off before the final whistle blew on a memorable evening. It was the first time Chester had beaten Barrow since April 1971. Alan Tarbuck – here this evening – was one of the Chester scorers on that occasion. He will have enjoyed this one almost as much. Chester: Lynch, Hall-Johnson, McCombe, Astles, Rowe-Turner, Shaw, Dawson (Turnbull 74), James, Chapell (Hannah 46), Zanzala, White (Bell 62). Subs not used: Mitchell, Jones. Boreham Wood: G.Smith, K.Smith, Woodards, Ricketts, Wells, Stephens, Jeffers (Holman 76), Champion, Balanta (Shakes 82), Murtagh, Andrade. Subs not used: Turley, Benson, Turgott. As Storm Brian whirled about the stadium, Chester and Boreham Wood began a war of attrition. The ball was in and out along the touchline below the main stand for the first fifteen minutes or so – neither side able to prise it away against the wind and witch to the other wing. It made for tedious viewing but to be fair it must have been even more difficult to play in. When the ball did visit the west side of the pitch Lathaniel Rowe-Turner scooped the ball back from just around the half-way line to concede an unlikely corner. It was almost inevitable that it would lead to a goal and Jeffers duly obliged when he headed in direct from the highly-rated Andrade’s kick. With City’s already fragile confidence shaken worse was to follow after a few more minutes. Although both teams struggled to control the ball in the conditions, when it did come down the visitors seemed surer of touch and more fleet of foot. An astute ball by Murtagh out to the right split two Blues players and found Kane Smith on the overlap. His cross was met on the slide by Astles but he only succeeded in teeing up Andrade to score The Wood’s second. In Chester’s sporadic attacking during the first half, Chapell had found room to drift a couple of promising crosses from the left but he was withdrawn at the break and replaced by Hannah. The Blues began to look more capable as an attacking force. Bell replaced Harry White and, with a quarter of an hour to go capitalised on some tentative defending to bring down a Kingsley James cross and fire a sweet left foot shot past Grant Smith. Brian continued to blow but the wind had gone out of City’s sails. Kidderminster Harriers: Hall, Pearson (Williams 48), Taylor, Croasdale, Horsfall, O’Connor, Sonupe (Austin 80), McQuilkin, Ironside, Ngwatala, Wright (Bradley 61). Subs not used: Brown, Weeks, Digie, Howkins. Chester: Lynch, Halls, Rowe-Turner, James, McCombe (Bell 72), Astles, Turnbull, Dawson, Waters (Chapell 46), White (Zanzala 61), Akintunde. Subs not used: Davies, Jones, Shaw, Crump. Chester went out of the FA Cup at the 4th Qualifying Round stage for the third season in a row, but this defeat at Kidderminster had to be the most disappointing of them all. It was hard to find a highlight from a dismal afternoon at the Aggborough Stadium, even the home side's famous pies ran out well before kick-off, as most of the travelling 522 fans seemed to want to sample some tasty fayre. It certainly wasn’t a feast of football for the Chester fans, who were making themselves heard right from the off. Their side’s two best chances were unchallenged headers for Kingsley James and John McCombe, but they were well off target. Kidderminster were simply the best in every area of the park, belying their status as a mid-table Conference North team. They were a tad lucky with their opening goal when a shot cannoned off the post on the 19th minute right to unmarked Emmanuel Sonupe, who had no trouble finding the net. Chester failed to respond to the challenge and it was hard to think of many of their passes finding the man, let alone giving them a chance to score. There was one change at half-time when Matty Waters was replaced by Jordan Chapell, but there was no marked improvement in team performance in the second half. It wasn't long before a growing number of the Chester fans were letting their feelings known to their lacklustre players with chants of “what a load of rubbish”, and this only got louder when Kidderminster when 2-0 up through a Joe Ironside header. It got so bad before the end of the game that several Chester fans were joining in with the Kiddie fans chanting “off, off, off” when the referee showed Andy Halls a yellow card. When the inevitable Kidderminster victory was confirmed, there was more anger shown by the travelling army. Manager Marcus Bignot took his team out for a ‘dressing-down’ within earshot of their chanting. It was at least 15 minutes after full-time before the last of the furious Chester fans left the ground, many of them heading straight to the nearby off-licence or one of the excellent local hostelries to console themselves after their early awakening from their Wembley dream. Booked: Shaw, James, Turnbull, Hannah. Tranmere Rovers: Davies, Buxton, Ridehalgh, McNulty, Sutton, Mottley-Henry, Jennings, Norburn (Harris 90), Hughes, Cook (McDonagh 61), Norwood. Subs not used: Pilling, Alabi, McEveley. Chester: Lynch, Rowe-Turner, McCombe, Astles, Halls, Turnbull, James, Dawson, Shaw (Joyce 90), Akintunde, Hannah. Subs not used: Chapell, Jones, Bell, Waters. Alex Lynch pulled off a series of fine saves to help Chester grab a point at Prenton Park. Manager Marcus Bignot made one change to his line-up with Paul Turnbull returning to replace the injured Craig Mahon. Lynch was called into action early on producing a superb one handed save to deny James Norwood who picked up on a loose Andy Halls clearance to volley at goal. Norwood saw another header flash wide of goal and Andy Cook almost headed in on the far post midway through the half as the home side dominated. Chester rarely threatened at the other end though Ross Hannah’s left footed effort went close. The home side appealed for a penalty on 25 minutes as Norwoood rounded Lynch before falling to the ground but referee Peter Wright booked the Rovers forward for diving. Lynch spread himself to again deny the lively Norwood as Tranmere finished the half well on top but with the brave Lynch denying them a goal. Chester slowly came more into the game during the second period as Tom Shaw saw an effort blocked and James Akintunde saw a rising shot from outside the box just clear Scott Davies’ bar. 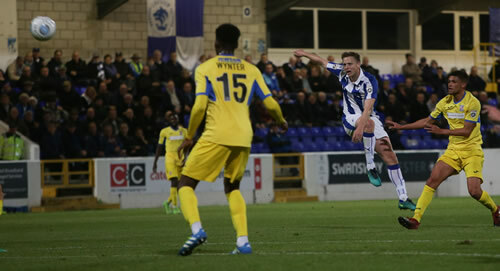 Lynch saved a Dylan Mottley-Henry header as Tranmere pushed in the closing minutes. Norwood sent a shot just wide and Ryan Astles was in the right place to block a Connor Jennings effort which came back off a post. With two minutes remaining Stephen McNulty headed wide and man-of-the-match Lynch produced his final save to deny Gerry McDonagh. Chester: Lynch, Halls, McCombe (Bell 80), Astles, Rowe-Turner, James, Shaw (Turnbull 66), Dawson, Mahon (Davies 20), Akintunde, Hannah. Subs not used: Joyce, Sheron. Woking: Baxter, Young, Staunton, Wynter, Saraiva (Stojsavljevic 71), Isaac, Ferdinand, Carter, Bawling (Ward 66), Charles-Cook, Philpot (Effiong 80). Subs not used: Orlu, Appau. Woking are very much a surprise package this season and came to Chester in sparkling form. They had won five out of the last seven including victories over Macclesfield and Sutton. As the game unfolded under a gibbous moon, it was easy to see why as they started much more rapidly than the Blues. The visitors appeared quicker to every ball and took just a touch to control it where City players, sluggish by comparison took two. The Cards kept up a high energy pressing game and put Chester under pressure whenever they were in possession. There were a number of forced errors as a result and it did not come against the run of play when Woking took the lead after just ten minutes. Young’s pinpoint cross from the right was met by Ferdinand’s precise header just inside the post. It got worse for City when Mahon was forced off after a clumsy challenge from behind by Isaac. Liam Davies was sent on as his replacement. Chester did managed to forge a couple of opportunities. First Dawson shot straight at the keeper from outside the area and then Baxter saved Hannah’s effort from much closer quarters. In the second half the Blues fought hard to get a toe-hold in the game. Hannah went close with a header at the far post and was then given offside as he made a second attempt to score. More agonising for City was seeing Astles’ glancing header strike the foot of the post and roll tantalisingly across goal before being cleared. 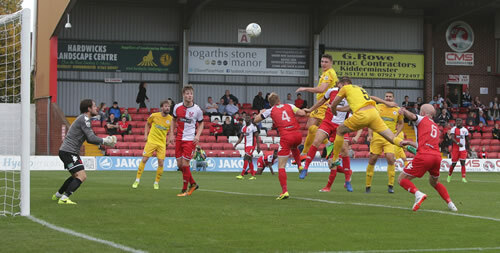 Within a couple of minutes of this near miss, Woking sealed the game at the other end. Philpot raced on to Hall’s under-hit back pass and came off better from Lynch’s onrushing challenge. The Cards’ forward was able to roll the ball into the empty net for a second and decisive goal. Understandably, the stuffing was knocked out of Chester by this blow but they continued to make a game of it but the Cards were resolute in defence. Although on another evening Chester might have forced a draw there was no denying that the visitors were slicker and quicker on the ball than City tonight. Woking moved up to third in the table with this win. Chester will look to raise their game for the local derby with Tranmere at the weekend.